I knew the day was coming, but I'm still sad to have popped down to Louie's Lunch for a burger to discover that Chef Jeff was no longer there. He's closing on the sale of his house in Freeville in a few weeks and moving farther away, and sticking around for another week or so at the lunch truck just didn't make sense for him. I get it, but it's a shame. His "charm" (OK, his acerbic wit) was a lot of the point of going, but also the care he put into making tasty food. 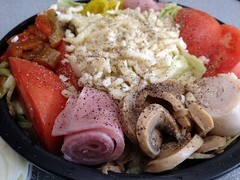 That chef salad was one of my first Louie's experiences after I started my job a short walk away, and even if the vast majority of lunches I've eaten there since weren't salads, it was nice to know I had that fresh-food option. Jeff and I have also definitely become friends. I've occasionally brought him a beer or something I'd cooked or baked, like the peach cobbler for our work Thanksgiving lunch. He's cooked up some fresh venison from his hunting successes to share. I've got his e-mail address and cell phone (that's how I confirmed he wasn't just taking a sick day) and can keep in touch, but it won't be the same. I wish I knew people who'd make such an offer for venison, sounds awesome! And sorry you're losing a friend at work.